All plants are excellent for removing excess nutrients from the water column which helps keep the water clear, all while creating a natural look for your pond. Some of the plants in the package will provide an excellent safe breeding ground for fish & snails. To save shipping costs, most plants are shipped in 2" pots, bare-root rhizomes or tubers. You will need to use your own pot & soil or purchase them on-line from us. Many plants can be planted directly into the gravel sub-straight used in most ponds today. All Pond Plant Packages are sent by UPS 2nd Day Air to make sure your plants arrive is the best condition possible. The shipping costs are a little higher than 3-day ground, but we prefer you to have perfect healthy plants, not wilting specimens. Orders are shipped from the growers, Monday - Thursday only. Orders placed on Friday,Saturday & Sunday, will be shipped out on Monday. As per the U.S.D.A., for states that have import restrictions on certain types of aquatic plants, we will make substitutions of acceptable plants of equal value. Your new purchase of aquatic plants from ShopTJB.com have been out of water for approximately 24 hours. Although they have been kept moist in shipping it is ESSENTIAL that they be returned to water AS SOON AS POSSIBLE. We recommend the use of planting containers or planting directly on the bottom of your pond. Containers will allow for the retrieval of plants for periodic maintenance and winterization. 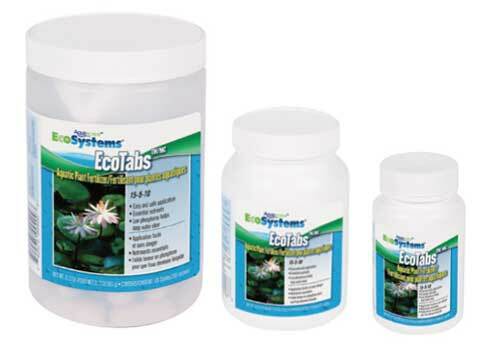 There are a variety of containers that are well suited for aquatic plants. There are plastic mesh pots and fabric baskets which allow roots to grow thru them and have more contact with the water. Traditional clay and plastic pots also make good homes for aquatic plants. Pot size should be matched to the size and type of plant. Because most water plants grow only in the top 10-12" of soil, that is as deep as the container needs to be. When planting, never use planter mix, or lightweight mixes with peat moss, bark, perlite or vermiculite or other light weight soils as they will just float to the top of your pond and the organic matter will decompose causing future problems. Clay soil works best as it stays soft in the water which allows roots to penetrate. Commercial aquatic soil is available at local nurseries or at ShopTJB.com. Leave 1-2 inches between the soil line and the rim of the container. Place clean gravel or small rocks in this area to both give the plant a more finished look and to help keep the soil inside the container and prevent your fish from disturbing the soil. Lotus Planting Instructions are at the end of this guide. Most plants need at least 5-6 hours or more of sunlight per day for maximum growth. We recommend that you fertilize your plants monthly with a fertilizer that was designed specifically for aquatic plants. They come in liquid, granular or tablet form. Never pour non-aquatic liquid fertilizer into a pond. Algae will absorb most of the nutrients. Granular can be used when potting, or we recommend using tablets (tabs) which look like very large pills. You simply push them into the soil of the plant. Avoid “once-a-season” timed release products. We have found that they dissolve too quickly adding too many nutrients to the pond at once. Never use tree spikes as they can burn the sensitive roots of the plants. A monthly routine of fertilization of pond plants will provide healthy plants with abundant flowers. Water lilies can be planted dormant, when they have few or no leaves or when they are in active growth, with leaves and roots. Fill your pot about two-thirds full of soil. Wet soil works best. Push a fertilizer tab or two about half way thru the soil. Make a mound in the middle of the pot with a handful of soil. Place the rhizome on the mound and spread the roots over the top of the soil so they are not under the rhizome. Sprinkle soil over the roots and around the rhizome adding just enough to cover the rhizome. Do not bury it. The crown should have no soil on it as it will have difficulty sprouting new leaves. Water the pot throughly or set it in a larger container of water. Top with gravel or small rocks avoiding covering the crown. You should see new growth in 7-10 days depending on the month in which you are planting. Hardy lilies are considered perennial and will survive the winter in zones 5 and above, provided the rhizome does not freeze. Typical blooming is from mid to late April thru Autumn. New lilies should not be introduced to your pond until the water temperature is 60 degrees. These lilies require a little detective work to plant at the right depth. Examine the lily’s stems starting at the base. Look for the point where the stem changes color from light to dark. This is the point from which the leaf emerged from the soil. When you plant the lily, the soil must be even with this point. This will ensure that you have the plants growing crown at the right depth. If it is planted to deeply it will usually stop growing in order to make new plants, taking some of the energy that was originally directed at the main crown. The actual planting procedure is the same as with the Hardy lily. Lilies are very buoyant and if your lily pops out of the pot and begins to float you can place a smooth rock on top of the soil or keep the plant in warm water for several days to reduce buoyancy. Tropical lilies are considered annuals and generally need to be replaced each season. New lilies should not be introduced to you pond until the water temperature is 72-75 degrees or they may go dormant or die. These plants should be planted in a 1-3 gallon containers and kept in several inches of water depth after planting. Do not fully submerge the pot for the first week. The stems are buoyant and may pop out. The same basic technique for planting lilies applies to marginal and bog plants. These plants can be planted as early as March as long as the water temperature is 50 degrees. Marginal plants usually need at least 2 to 6 inches of water over the roots. These plants require no planting and have an extensive root system that provide your fish with hiding and spawning areas while providing them with shade, oxygen and algae containment (not to mention a good snack ). Treat them as you would any annual and replace them each season. Hyacinth roots are prone to breaking off in shipment. This will not affect the growth of the plant. Lotus plants are sold as tubers. They are available in April and May while they are still dormant. The Lotus tubers are tube shaped with sections. There should be a couple of sections to the tuber, sometimes there could be more. The tubers will be different sizes depending on the type of lotus you have ordered. They range from the size around of a pencil to as large as a zucchini. Length could be 4 to 24 inches. The size of the tuber does not determine the quality of the plant. You need to locate the growing tip. There should be at least one tip on each section of the tuber. The growing tip of the tuber is VERY FRAGILE. The main reason people fail when trying to grow a lotus is because they either scratch, break or bury the growing tip, or worse yet, they try to break the lotus tuber into more sections so they will get more lotus plants. If the growing tip is broken, chances are that section will not break dormancy. When placing your lotus in the pond, the pot they are planted in needs to be anywhere from 3 to 6 inches below the surface of the water. Lotus, DO NOT like fluctuations in water temperatures. The tuber will be fine in water that is at least 55 degrees, but you must be sure that the water temperature does not drop to 45 degrees or the lotus tuber may go dormant and may not come back. Some of our customers grow the lotus indoors or in a greenhouse until the weather has stabilized. If you do this, be sure when you transfer the lotus, the water temperature in your pond outside is equal to the water temperature that you have been growing the lotus in. Be sure you are going to keep the tuber in the same pot. It is not advisable to transfer the lotus from one area to another once they have taken root and started growing. Pots from 12-16" are recommended depending on the size of your Lotus. Transplanting must be done prior to the lotus coming out of dormancy in the spring, before they start sending out runners. When you plant your lotus, we recommend you prepare the soil in the pot about a week before. Pack the soil when it’s dry and put fertilizer tabs in at this time. Next, put the pot into the pond or submerge it into the body of water where you will be growing the lotus. When you plant the lotus, just gently lay it on top of the soil or lay it in a groove you have made with your finger in the soil. DO NOT BURY THE TUBER. You can use a rock to keep the tuber from floating to the top, or, you can use a U shaped wire that will not rust in the water, on the largest part of the tuber to hold it down. Don’t put the wire on the joint of the tuber. Be sure the growing tip is pointing up. Be careful not to confuse the growing tip with the leaf. The leaf will appear first, and right next to it is the growing tip which will come out from under the stem of the leaf. Sometimes people think the growing tip has been broken, when it was the leaf that was broken. The leaves will sprout out before the growing tip so you can see which is which. Be sure to feed your lotus at least every 3 to 4 weeks as they are very heavy feeders during the growing season. Depending on where you live, the lotus should start blooming late July and continue to late August. In warmer regions, lotus may start blooming much earlier. Keep in mind, lotus like FULL SUN with 80 to 95 degree temperature for at least 3 months in order to grow and bloom. Whether or not the lotus blooms the first year depends on the weather. In most cases lotus will bloom the first year. Lotus leaves will rest on the water for a time until they develop strong roots to hold the leaves of the plant above the water. Caution: Be careful when introducing lotus into a natural pond. Once established, lotus can be extremely invasive!!! We are periodically asked what to do with waterlilies that have out grown their container. Mature waterlilies typically like to be crowded in their environment but if it has grown out over the side of the pot, has roots freely dangling in the water or has split the container, it is time to transplant your lily. Your lily can be transplanted any time they are actively growing. Carefully remove it from the pot being careful not to disturb the roots and trim away any damaged or dead leaves. If you feel any soft or mushy spots in the tuber carefully cut or remove that portion. Place the lily in a new container, adding sufficient dampened soil to cover the lily but not the growing tip. We recommend aquatic soil. Never use planters mix, humas, potting soil etc. The lily gets its nutrients from the pond water and you do not want to add other nutrients or chemicals found in these soils. Press one or two fertilizer tabs into the soil and continue to feed monthly during the growing season. Gravel, decorative rock etc. can be added for weight or to keep playful Koi away from the plants. If you have an especially large tuber with multiple growing tips you can divide this into several lilies. Carefully cut the tuber so that each section has a growing tip and feeding roots. You can remove the long white anchor roots by cutting them at the tuber. Leave as many feeding roots as possible as this will stimulate new growth. Remove the nature leaves. You can leave the young or unfurled ones on the tuber. You can then pot them as described above. These new lilies should be kept at the shallow end of the pond with in no more than 6-12" of water until new growth begins.